Playing Mastermind board game is great entertainment for individuals who enjoy games that help hone their logic and deductive reasoning skills. This challenging game requires abstract reasoning and concentration. It is both educational and enjoyable. Mastermind is designed to be played by two people over the age of eight. The game includes a decoding board, code pegs, and key pegs. Each player takes a turn creating a secret code that the other player will try to decipher. Prior to beginning to play, the players have to decide how many rounds they are going to play, being certain to select an even number. Players alternate filling code maker and code breaker roles. The person who creates the code is referred to as the code maker, and the person trying to figure out the code is the code breaker. The game board features twelve rows, each of which contains four large holes beside four small holes. There is also another row with four large holes on one end of the board covered by a shield. This is where the person playing the role of the code maker sets up the hidden code that his or her opponent will try to crack. The code consists of four round headed code pegs in any of six different colors. Once the code maker has created the code, the other player has to attempt to guess the exact combination of code pegs, including both color and position. The player trying to crack the code has to use his or he logical reasoning skills to use the clues to narrow down which of the more than 1,200 possible combinations of pegs comprises the code. Following each guess, the code maker will provide clues about what the code really is. Players are allowed 12 tries to crack the code, one for each row on the game board. The code breaker conveys his or her guesses by filling in a row of code pegs on the game board. The code breaker gives feedback by placing flat headed key pegs on the board to indicate which parts of the guess are right or wrong. A colored key peg indicates that a particular code peg is the correct color and position. A white key peg indicates that a peg's color is included in the code, but is in a different position than indicated. The code breaker keeps guessing until he or she cracks the code or makes 12 incorrect guesses. The code maker earns a point every time the code maker takes a guess. If the code breaker is unable to decipher to code in 12 guesses the code maker receives an extra point. Once the agreed upon number of rounds have been completed, the person with the most points is the winner. The original Mastermind game was released in the early 1970s, and several additional versions have been released over the decades. Advanced Mastermind - Those who have mastered the standard edition will enjoy this extra-challenging version of the popular game with extra colors and peg spaces, allowing for more than 5,000 possible combinations. Attaché Mastermind - Designed for the true Mastermind fan, this version comes with a zippered attaché case with zippered pockets for easy storage and transportation. Mastermind Deluxe Travel Edition - This version is a miniature, self-contained game perfect for on-the-road play. 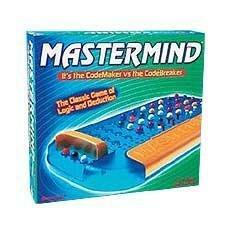 Mastermind for Kids Board Game - This version of the game is specifically designed for children as young as six. The next time you feel like putting your critical thinking skills to the test, try your hand at the Mastermind board game. You'll have fun and polish your logic and reasoning techniques.